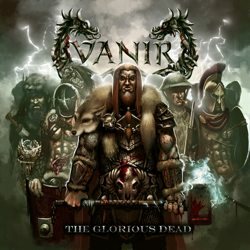 Danish folk metallers Vanir will release their third full-length album entitled “The Glorious Dead” via Mighty Music on October 20th 2014. This album marks a new stylistic direction with influences from a number of melodic metal genres – but still centered on the Viking and battle thematics. Coming off of their second album “Onwards Into Battle“, the Vanir anno 2014 is set to give praise to the ‘Glorious Dead’ throughout the ages of man. After experiencing a line-up change in 2013, Vanir remains dedicated to writing and producing Viking and battle themed metal with influences from a number of melodic metal genres, though with a sharper edge than ever before! Once again the band has visited Berno Paulsson at Berno Studios in Malmö for the production of “The Glorious Dead“. Cover artwork and album tracklist are already unveiled, together with the album opener “Fall of the Eagle” that you can listen here. This song is a tribute to the Germanic tribes led by the warlord Arminius of the Cherusci that stopped the Roman general Publius Quinctilius Varus at the Battle of Teutoburg Forest in 9 AD!